. : Optics & Photonics Focus :: Cells in the Heart Dance to the Tune of Light :. Every morning, on the seabed, a cuttlefish wakes up. It knows it must camouflage itself to fool its predators. Every morning, on the seabed, a predator fish wakes up. It knows it must keep its eyes peeled, if it wants to eat. The game for survival is on. Who will win? Contracting heart cell. The image sequence shows the actual contraction of a cardiomyocyte, after it has been exposed to a series of femtosecond laser pulses. Since time immemorial, poets have found millions of ways to describe why the heart beats. The poet Feras Haddad ascribed his heart beat to the love of his beloved. In principle, however, the heart beats because of synchronized contraction and relaxation of specialized muscle cells in it, called cardiomyocytes. Each of these cardiomycytes is like a tiny heart, which can contract and relax by itself. For the whole heart to act like a pump and propel blood into the circulatory system, precise control and synchronization of these cells is necessary. Without this control the heart would just vibrate randomly and not pump as a whole. Nature has always amazed us with her mastermind. Here she has come up with an efficient control system using electrical pulses, built into a specialized area (sinoatrial node) of the heart itself. This process is termed pacemaking. Now Nicholas Smith and his colleagues at Osaka University, Japan have demonstrated that ultrashort optical pulses can be used for pacemaking. The laser pulses used in this work were extremely short: only 150 femtoseconds in time; a femtosecond is to a second, what a second is to about 32 million years. When a cardiomyocyte is excited, an electrical signal, called an action potential is produced and spreads to the rest of the cell. This causes an increase in the level of calcium ions, as a result of its release form the calcium store called sarcoplasmic reticulum. The calcium ions bind and interact with molecules associated with the cell’s contractile machinery, the end result being a mechanical contraction. Any means that can induce elevations in calcium ions can as a result induce electrical firing of cardiomyocytes [1,2]. Femtosecond laser irradiation is one of these means and can result in cardiomyocyte contraction. "We looked at the biological nature of the laser cell interaction and determined how the laser triggered the calcium response," says Smith. "If you look at the processes that occur in a heart muscle cell during contraction," Smith adds, "the calcium ion concentration periodically rises and falls as the cell contracts and relaxes. We thought that the laser-triggered calcium effect could be put to use inside heart muscle cells, where calcium is used to control the cell contraction." The Osaka University group isolated cardiomyocytes form the hearts of neonatal rats and dispersed them in culture medium. In a culture dish, there is no electrical regulation, and these cells contract at a rate which spontaneously emerges by synchronization between neighboring cells. When the researchers exposed the cells to near-infrared (NIR) femtosecond laser pulses for short controlled periods of time, the cells started to contract differently. The spontaneous contraction periodicity was modified in accordance with the light pulses. 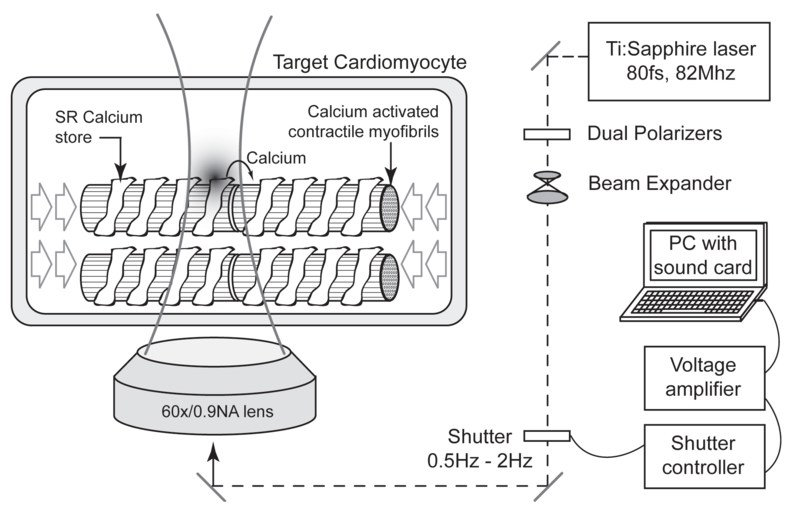 It was seen that laser irradiation triggered calcium elevations resulting in cellular contraction and leading to optical pacemaking of cardiomyocytes . Once the laser influences the contraction of the irradiated cell, the effect spreads out to neighboring cells. This happens through a combination of electrical signal propagation and mechanical coupling between the contracting cells. "The laser can therefore act as a pacemaker for a group of cells," Smith notes. In the future, it could be possible to use laser irradiation to pacemake a whole heart. However, at the moment medical applications of this technique are limited by the danger of damage to the target cells. "It is still very early, and we have not yet explored the different types of responses that may occur with different laser wavelengths, exposure times and irradiation power," Smith underlines. "It may be possible to find a condition whereby the cells can be stimulated without any damage over the long run." "It is important to clarify whether or not the repetitive application of the laser to the cardiomyocytes damages the cells," points out Hideo Tanaka from Tetsuro Takamatsu's group in Kyoto Prefectural University of Medicine in Japan. "Further studies are also mandatory to determine whether the femtosecond laser technology can really initiate and perpetuate heart beats," he asserts. In any case, "if the application of femtosecond pulses induces consecutive electrical excitations and does not cause any major damage to the cells, this novel approach could become an epoch-making means to pacemake the heart." There could be many fascinating applications of this technology. "We are now looking at the viability of cardiomyocyte actuators and whether they could function in a manner similar to MEMS," Smith says. MEMS (Miniaturized Electro Mechanical Systems) are micro actuators built out of micron sized mechanical devices, usually arranged in ordered arrays and controlled electrically. The same could be done with cardiomyocytes arranged in ordered arrays but controlled with optical pulses. The advantage here would be that the system could use ATP (biological currency for energy) to run itself, and this technique could be applied to problems that can not be solved by conventional actuators like for therapeutic implants. "I think this could be a very interesting idea, and it is quite a science-fiction type concept," Smith envisions. "It's still early to really claim too much about these issues, though. We will see what happens." This heart beats, cause it sees light. K. Fujiwara et al., Burst emergence of intracellular Ca2+ waves evokes arrhythmogenic oscilllatory depolarization via Na+-Ca2+ exchanger, Circ Res to be published (2008). V. A. Maltsev et al., Normal heart rhythm is initiated and regulated by an intracellular calcium clock within pacemaker cells, Heart Lung Circ 16, 335-348 (2007). N. I. Smith, Y. Kumamoto, S. Iwanaga, J. Ando, K. Fujita, and S. Kawata, A femtosecond laser pacemaker for heart muscle cells, Opt Express (2008) 16, 8604-8616 (link). Video 1: Heart cells dance to the tune of laser light. The laser irradiation focus can be seen as a flashing spot in the movie that lights up at a rate of 1 Hz. After several exposures the contraction periodicity of the cells synchronizes with the laser irradiation, demonstrating the pacemaker effect.